Jacob Masters is a fictional character from the British medical drama Casualty , played by Charles Venn. He made his first appearance during the twenty-ninth series episode "If You Could Bottle It", which was broadcast on 18 July 2015. Venn's casting was announced on 13 February 2015 and he began filming at the show's studios that same week. Jacob is a former army medic turned nurse, who is given a job at Holby City Hospital after he brings a patient into the Emergency Department (ED). Charles Venn, formerly known by the stage names Chucky Venice and Chucky Venn, is a British actor, known for his roles as Ray Dixon in EastEnders, Jacob Masters in Casualty, Curtis Alexander in Sky One's Dream Team and Tremaine Gidigbi in Footballers' Wives. The twenty−ninth series of the British medical drama television series Casualty commenced airing in the United Kingdom on 30 August 2014, and concluded on 23 August 2015. The series consisted of 46 episodes. Erika Hossington continued her role as series producer, while Oliver Kent continued his role as the show's executive producer. Fifteen cast members reprised their roles from the previous series with three long-serving cast members departing during this series. Jane Hazlegrove reprised her role as paramedic Kathleen "Dixie" Dixon in the premiere episode, following a three month absence. Sunetra Sarker, William Beck and Michael Stevenson reprised their roles as ED consultants Zoe Hanna and Dylan Keogh, and paramedic Iain Dean in October 2014. Charles Venn joined the show's main cast in summer 2015 as senior staff nurse Jacob Masters. Jaye Griffiths is a British stage, television and voiceover actress. Constance "Connie" Beauchamp is a fictional character from the BBC medical dramas Holby City and Casualty, portrayed by actress Amanda Mealing. She first appeared in the series six, episode 35, "In at the Deep End", broadcast on 1 June 2004, and appeared in Holby City's sister show Casualty multiple times, having already appeared in crossover Casualty@Holby City episodes. Mealing continued her role as Connie until the thirteenth series of Holby City, departing in the 28 December 2010 episode "Snow Queens". Connie's role in Holby City was that of Clinical Lead of Cardiothoracic Surgery in Darwin, and Joint Director of Surgery. Sam Nicholls is a fictional character from the BBC medical drama Casualty, played by Charlotte Salt. She first appeared in the twenty-sixth series episode "Mea Culpa", broadcast on 15 October 2011. Sam is a former major in the Royal Army Medical Corps, who joined the Holby City Hospital Emergency Department on a nine-month secondment, later becoming a Specialty registrar in emergency medicine. Salt was contracted for a year and she spoke with army medics to help her prepare for the role. Charlotte Salt is an English actress best known for her many characters in British and US television series like Casualty, Bedlam and The Musketeers, also in many movies, including Beneath Still Waters in 2005, Beowulf in 2007, and Blood and Glory in 2016. Ellen Thomas is a British actress originally from Sierra Leone who has performed many television and film roles, but is perhaps best known for her recurring role in the Channel 4 Bristol-based comedy, Teachers or as Grace Olubunmi and Claudette Hubbard in EastEnders. BBC Online, formerly known as BBCi, is the BBC's online service. It is a large network of websites including such high-profile sites as BBC News and Sport, the on-demand video and radio services co-branded BBC iPlayer, the children's sites CBBC and CBeebies, and learning services such as Bitesize. The BBC has had an online presence supporting its TV and radio programmes and web-only initiatives since 1994 but did not launch officially until December 1997, following government approval to fund it by TV licence fee revenue as a service in its own right. Throughout its short history, the online plans of the BBC have been subject to harassment from its commercial rivals, which has resulted in various public consultations and government reviews to investigate their claims that its large presence and public funding distorts the UK market. Ray Dixon is a fictional character from the BBC soap opera EastEnders, played by Chucky Venn. Ray is an ex-partner of character Bianca Butcher and the father of her son Morgan Butcher. He made his first on screen appearance on 10 January 2012. His storylines have involved meeting and getting to know Morgan, a relationship with Kim Fox and starting a youth mentoring scheme. On 16 April 2013 it was announced that Venn had been written out of the show, and departed on 28 May 2013. He appeared in 107 episodes. Casualty is a British medical drama television series that premiered on 6 September 1986 on BBC One. The series was created by Jeremy Brock and Paul Unwin. It is set in the fictional Holby City Hospital, in the equally fictitious city of Holby, and features occasional crossovers of characters and plots with spin-off show Holby City. Casualty follows the professional and personal lives of the doctors, nurses, paramedics, hospital management and patients at Holby General. It features an ensemble cast of regular characters, and began with 10 main characters in its first series, all but two – Charlie Fairhead and Lisa "Duffy" Duffin – have since left the show. Many main characters have been written in and out of the series since. In addition, Casualty features guest stars each week, as well as recurring guests that take part in story arcs that span a portion of a series or multiple series'. Tess Bateman is a fictional character from the BBC medical drama Casualty, played by Suzanne Packer. She first appeared in the series eighteen episode "End of the Line " on 13 September 2003. Tess is currently a senior ward sister. From her arrival until 2005, Tess was an emergency nurse practitioner and following that, she was promoted to clinical nurse manager for six years, until 2011. In May 2011, Tess resigned from her position and resumed the role of Band 7 Ward Sister, with Linda Andrews taking over her previous position. Nine weeks later, Linda resigns and Tess is reinstated as clinical nurse manager. Tess then continues this post for nearly a further four years when, in January 2015, Tess resigns to help set up a new health centre as a secondment. She returns two weeks later as a Band 7 Ward Sister, with Rita Freeman taking over her previous position. "Exile" is the thirty-second episode of the twenty-ninth series of the British medical drama Casualty. It was written by Kelly Jones, directed by Steve Hughes, and produced by Jonathan Phillips. "Exile" first aired on 16 May 2015 on BBC One in the United Kingdom. 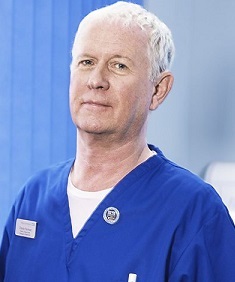 The plot sees Charlie Fairhead and Connie Beauchamp travel to Bucharest to help Charlie's son Louis, who has become a heroin addict and is planning on selling his kidney to pay his debts. Lily Chao is a fictional character from the BBC medical drama Casualty, played by actress Crystal Yu. She first appeared in the series twenty-eight episode "Bedside Manners", broadcast on 3 August 2013. Lily arrives at Holby City hospital to resume her second year of the Foundation Programme. Yu had previously appeared in the show as a separate guest character. She also decided to learn certain medical procedures to make her character believable. Lily is characterised as an ambitious junior doctor and intelligent high-achiever. Lily is good at her job but lacks any "bedside manner" and her no-nonsense attitude causes problems with colleagues and patients alike. The character was originally working towards a career in dermatology but becomes accustomed to the variety of work the Holby City's Emergency Department has to offer. Ethan Hardy is a fictional character from the BBC medical drama Casualty, played by actor George Rainsford. He first appeared in the series twenty-eight episode "Bad Timing", broadcast on 11 January 2014. Rainsford's casting was announced alongside Richard Winsor who had been hired to play Ethan's brother Caleb Knight. The pair were described by the show's executive producer Oliver Kent as completely different characters who would change the dynamic on he Casualty. Ethan is a Specialist registrar in emergency medicine and is an excellent medic who had worked hard to achieve his position in the profession. He is characterised as a shy, socially awkward person with a serious and attentive attitude. Throughout his inclusion in the show Ethan has shared an on-screen friendship with like minded Lily Chao. He has had romantic stories alongside the character Honey Wright. Writers developed Ethan's relationship with his brother Cal into a sibling rivalry. This has provided both characters with dramatic stories. Caleb "Cal" Knight is a fictional character from the BBC medical drama Casualty, played by actor Richard Winsor. He first appeared in the series twenty-eight episode "Brothers at Arms", broadcast on 18 January 2014. Winsor had previously auditioned for a role in Casualty's spin-off show Holby City. Producers were impressed and recalled him to read for the part of Cal. Winsor's casting was announced alongside George Rainsford who was hired to play Cal's brother Ethan Hardy. The pair had to pass a screen test together as producers were looking for a strong sibling chemistry. Cal's role in the show is a Specialist registrar in emergency medicine. He was originally introduced as a locum. The medic is played as a lothario and womaniser type character. He can manipulate those around him with charm to better his career. Writers gave Cal a backstory detailing the difficult relationship with his father and brother. Despite having the same parents Cal and Ethan had different upbringings, which sets up a sibling rivalry. Their relationship has been important in the development of both characters. Executive producer Oliver Kent has called the character consistent because when faced with trauma, Cal gets drunk, sleeps with women and makes a fool of himself. Dylan Keogh is a fictional character from the BBC medical drama Casualty, played by William Beck. He first appeared in the twenty-fifth series episode "Only Human", broadcast on 12 March 2011. The character was introduced as a replacement for fellow emergency medicine doctor Ruth Winters. Beck had briefly attended medical school before becoming an actor, and he felt the role was right for him. Dylan is a Consultant in emergency medicine and a member of Holby City Hospital's emergency department staff. Alicia Munroe is a fictional character from the BBC medical drama Casualty, played by Chelsea Halfpenny. She first appears in the series thirty episode "Cradle to Grave", broadcast on 19 September 2015. The character is introduced as an F2 doctor for a workplace bullying storyline with registrar Lily Chao, appearing for a stint of eight episodes. Alicia is characterised as bright, bubbly and a try-hard, making her appear naive. Despite this, Alicia is a brilliant doctor who always does more than is acceptable for her patients. Alicia's backstory states that she has grown up in Newcastle where she attended medical school, but recently moved to Holby. Ben "Lofty" Chiltern is a fictional character from the BBC medical dramas Casualty and Holby City, played by actor Lee Mead. He first appeared in Casualty's twenty-eighth series episode "The Last Chance Saloon", broadcast on 1 March 2014. The character is introduced to fill the role of a young, male nurse. Mead previously appeared in the drama in the twenty-sixth series of Casualty. Lofty originally appears as a staff nurse but is promoted to senior staff nurse in 2016. The character is specifically written for Mead and he was contracted to the show for a year. Lofty is portrayed as a nice person who is likeable and popular. His cluminess often leaves him in awkward situations although he is a brilliant nurse and a team player. Lofty's backstory states that when his parents grew tired of his wild behaviour, they kicked him out. Episode 1068 is the nineteenth episode of the thirty-second series of the British medical drama television series Casualty, and the 1068th episode of the overall series. The episode was written by Matthew Barry and Kelly Jones and directed by Judith Dine, and premiered on BBC One on 13 January 2018. The episode features the return of Zoe Hanna, who departed the drama in 2016, and departure of Zoe's estranged husband Max Walker, who has appeared on the drama for over three years. Sarker reprised her role for Davis' exit following a deal they made when she left the series. Davis' departure was not announced before the transmission of the episode as to surprise viewers, and the couple departed together. The thirty-third series of the British medical drama television series Casualty began airing on BBC One in the United Kingdom on 11 August 2018, one week after the end of the previous series. The series will consist of 47 episodes. Lucy Raffety continues her role as series producer, while Simon Harper continues his role as the show's executive producer. Sixteen regular cast members reprised their roles from the previous series. The series, which is billed as "The Year of the Paramedic", begins with a motorway collision stunt sequence, and features a crossover episode with spin-off series, Holby City. Charlotte Salt, Chelsea Halfpenny and Azuka Oforka departed their roles as Sam Nicholls, Alicia Munroe and Louise Tyler during the series, while actors Gabriella Leon and Shaheen Jafargholi joined the cast as student nurses Jade Lovell and Marty Kirkby in episode 12 and 13 respectively. 1 2 3 4 5 "Charles Venn joins BBC One's Casualty". BBC Media Centre. 13 February 2015. Retrieved 28 July 2018. 1 2 3 4 5 6 7 8 Jones, Allison (18–24 July 2015). "My Casualty co-star is my long-lost cousin!". Inside Soap (28): 41. 1 2 3 4 5 "Charles Venn hopes Casualty role was worth the wait". The Sunday Post . 12 July 2015. Retrieved 28 July 2018. 1 2 "Jacob Masters played by Charles Venn". BBC Online . Retrieved 31 July 2018. ↑ Reilly, Elaine (19 June 2016). "Our seven favourite facts about Casualty's Jacob Masters". What's on TV . Retrieved 9 August 2018. 1 2 "Master of the ED?". Inside Soap (34): 32. 29 August – 4 September 2015. 1 2 3 4 5 6 7 8 Ellis, Sarah (26 September – 2 October 2015). "Jacob's fight for life!". Inside Soap (38): 22–23. 1 2 "Shot to hell". Inside Soap (42): 26. 24–30 October 2015. ↑ "Jacob's revenge!". Inside Soap (43): 33. 31 October – 6 November 2015. 1 2 3 4 Ellis, Sarah (2–8 July 2016). "Jacob's river plunge!". Inside Soap (26): 28–29. ↑ Brown, David (21 September 2015). "Casualty autumn spoilers: Connie and Jacob get close, new trauma for Lily – and is Cal a dad?". Radio Times . Retrieved 3 August 2018. 1 2 3 4 5 6 Ellis, Sarah (5–18 December 2015). "Connie & Jacob get it on!". Inside Soap (48/49): 20–21. 1 2 Dray, Kayleigh (31 March 2016). "Casualty spoilers: Connie and Jacob buried ALIVE in shock accident". Closer . Retrieved 4 August 2018. 1 2 3 4 Ellis, Sarah (2–8 April 2016). "Buried alive!". Inside Soap (13): 21. 1 2 Reilly, Elaine (20 May 2016). "Charles Venn: 'Being buried alive in Casualty was the most challenging thing I've shot' (VIDEO)". What's on TV . Retrieved 4 August 2018. ↑ Reilly, Elaine (18 May 2016). "Amanda Mealing: The love is still there for Connie and Jacob". What's on TV . Retrieved 4 August 2018. 1 2 Methven, Nicola (28 July 2016). "Love rules in Casualty as Connie and Jacob rekindle their romance – sealed with a kiss". Daily Mirror . Retrieved 5 August 2018. 1 2 Brown, David (26 August 2016). "Amanda Mealing on filming Casualty's 30th anniversary – 'I spent a week getting upset for 12 hours a day'". Radio Times . Retrieved 5 August 2018. ↑ Lindsay, Duncan (12 December 2016). "EastEnders legend Pam St Clement returns to Casualty and 7 other spoilers". Metro . Retrieved 5 August 2018. 1 2 Dainty, Sophie (7 September 2017). "Exclusive: Casualty: 15 exciting secrets and spoilers from the show's new boss Lucy Raffety". Digital Spy . Retrieved 3 August 2018. 1 2 3 4 Ellis, Sarah (9–22 December 2017). "Jacob's big shock!". Inside Soap (49/50): 22–23. 1 2 3 Reilly, Elaine (9 December 2017). "Jaye Griffiths: 'Elle and Jacob's friendship is broken in Casualty'". What's on TV . Retrieved 6 August 2018. 1 2 "Father figure". Inside Soap (2): 24. 13–19 January 2018. 1 2 3 Reilly, Elaine (16 January 2018). "Heart-breaking scenes in Casualty for Elle and Jacob as the police arrest their teenage son Blake!". What's on TV . Retrieved 8 August 2018. ↑ Ellis, Sarah (10–16 February 2018). "Is Blake going to jail?". Inside Soap (6): 24–25. ↑ Duribe, Jazmin (10 February 2018). "Casualty viewers flabbergasted as Blake's sentence is revealed". Daily Star . Retrieved 8 August 2018. ↑ Dainty, Sophie (14 April 2018). "9 of the biggest Casualty storylines to come, including Connie's return and turmoil for Alicia". Digital Spy . Retrieved 29 July 2018. ↑ Reilly, Elaine; Cannon, Nick (9–15 June 2018). "Sam kisses Jacob!". What's on TV : 14. 1 2 3 4 5 Ellis, Sarah (9–15 June 2018). "Jacob likes a woman who can challenge him – Sam ticks all the boxes!". Inside Soap (23): 50–51. 1 2 Dainty, Sophie (15 August 2018). "Exclusive: Casualty: 15 HUGE secrets and spoilers from the show's boss Lucy Raffety". Digital Spy . Retrieved 15 August 2018. ↑ "In and out". Inside Soap (32): 92. 11–17 August 2018. 1 2 3 "Mother of all shocks!". Inside Soap (40): 37. 6–12 October 2018. ↑ "2016 – Winners". Screen Nation. Retrieved 13 August 2018. ↑ Minchin, Abbi (20 January 2016). "This Years NTA Nominees". VIVA Magazine. Retrieved 27 July 2018. ↑ Graham, Alison (July 2015). "Series 29 - Episode 37 If You Could Bottle It–". Radio Times . Retrieved 27 July 2018. ↑ Graham, Alison (July 2015). "Series 29 – Episode 38 The Next Step". Radio Times . Retrieved 27 July 2018. ↑ Wade, Holly (8 August 2015). "Meet the cast of Casualty". Radio Times . Retrieved 9 August 2018. ↑ Reilly, Elaine (17 November 2017). "Casualty cast 2017 – Who's Who guide to the BBC1 drama". What's on TV . Retrieved 8 August 2018. ↑ Reilly, Elaine (26 May 2016). "Casualty's Charles Venn: We wanted to make it so steamy couples would want an early night!". What's on TV . Retrieved 10 August 2018.